It’s essential to rid your system of any toxin build up and heavy metals. Additionally, it will restore your body’s natural functions to prepare you for a journey of a healthier lifestyle. To ensure the best results, drink plenty of water as hydration is always crucial in any detoxification process. Bitter herb native to India, Andrographis, is known to help protect a damaged liver by returning enzyme levels to normal especially if destruction has been done from alcohol, certain carcinogens and parasites. Silymarin protects liver cells, neutralizes toxic compounds and it exerts membrane stabilizing activity. Dandelion tea is high in antioxidant properties that help cleanse the liver to promote proper function, relieve constipation and soothe an upset stomach. 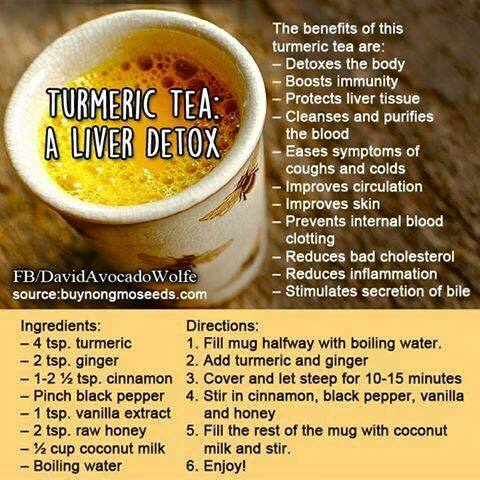 Two cups a day will strengthen your immune system and prove beneficial for kidney and gallbladder as well. Apple cider vinegar may soothe any liver related ailments such as abdominal bloating, stomach aches and intestinal cramps. 1-2 teaspoons of apple cider vinegar in a cup of water on an empty stomach (first thing in the morning) will flush the liver, improve your body’s blood filtration and increase your energy levels. Raw garlic clove will activate your livers’ enzyme to flush out excess toxins. Take one every day for a week to see results. Grapefruit juice and exercise/ heavy physical activity can stimulate digestion which will assist in liver detoxification.